Tag line: "His animal instinct cannot be tamed!" Larry Forbes (Shepperd Strudwick), a young American doctor, has just arrived in France to meet up with his fiancé, Madelon (Lynne Roberts), the niece of noted researcher Dr. Renault (George Zucco). During his stay at a nearby Inn, a man, who accidentally fell asleep in Dr. Forbes’ room, is murdered. Convinced the killer was actually after Dr. Forbes, police inspector Duvall (Arthur Shields) launches an investigation into the matter. But who committed this heinous crime? Was it Rogell (Mike Mazurki), an abrasive, wise-cracking ex-convict working for Dr. Renault, or Noel (J. Carrol Naish), Renault’s dim-witted manservant, who has himself fallen in love with Madelon? As you can gather from the above, a fair portion of 1942’s Dr. Renault’s Secret plays out like a mystery, with the inspector, as well as everybody else, trying to determine who’s after Dr. Forbes, and why. As it turns out, both of the main suspects have motive: Noel loves Madelon, the only person who treats him kindly, and doesn’t want her to leave; while Rogell is drawn to the sizable amount of cash Dr. Forbes brought with him from America, which Rogell discusses at length with Renault’s butler, Marcel (Charles La Torre). The film keeps the killer’s identity a secret for some time, casting the light of suspicion back and forth between Noel and Rogell until the end. 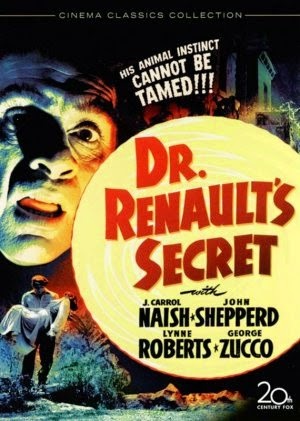 But I’m not recommending Dr. Renault’s Secret because of its central mystery (which is only so-so, and not particularly engaging). The reason to see this movie is the performance of J. Carrol Naish, whose Noel is as strong as he is simple-minded. Truth be told, Noel is a poor excuse for a manservant: Sent into town to meet Dr. Forbes, he forgets to pick up Madelon’s shoes, which she wants to wear to the upcoming Bastille Day celebration. Yet, at the Inn the night before, he nearly strangles the man that would eventually be murdered, believing an innocent remark he made was meant as an insult directed towards Madelon. It’s clear from the outset that there’s something very different about Noel (while driving Dr. Forbes to the Renault estate, Noel abruptly stops the car to avoid hitting a dog, despite the fact he couldn’t see the animal, which was around the corner at the time), and the questions surrounding his character’s origins prove much more interesting than the film’s murder mystery.